Breakfast At The Hotel And Today We Drive To Pink City Jaipur And We Reach Jaipur By Evening And Check In At The Hotel And Our Rest Of Day Is Free For Leisure And Overnight At The Hotel. Breakfast At The Hotel And Today We Visit Jaipur. We Start With Amber Fort There We Reach Amber Fort By Elephant Ride And After Seeing Amber Fort We Visit To City Palace & Museum And Later On We Visit Hawa Mahal (Palace Of Winds). In The Evening We Come Back To The Hotel And Overnight At The Hotel. Breakfast At The Hotel And Today We Drive To Agra And Enroute We Visit Fatehpur - Sikri (Once Capital Of King Akbar) Later On We Continue Our Journey To Agra. 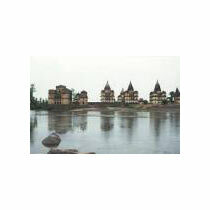 We Reach Agra And Check In At The Hotel And Our Day Is Free For Leisure And Overnight At The Hotel. Breakfast At He Hotel And Today We Visit The Taj Mahal And Agra Fort And Later We Drive To Delhi And Enroute We Visit Sikandara And After That We Continue Our Journey To Orchha And Check In At The Hotel And Overnight At The Hotel. Breakfast At The Hotel And Today We Visit Orchha Temple And Drive To Khajuraho And Check In At The Hotel And Our Rest Of Day Is Free For Leisure And Overnight At The Hotel. Breakfast At The Hotel And Today We Go For Half Day Tour Of Temples Of Khajuraho And Later We Are Transferred To The Airport For The Flight To Varanasi. Upon Arrival We Are Transferred To The Hotel And Check In At The Hotel And Later We Go For Half Day Tour Of Varanasi And In The Evening We Attend Aarti On The Ghats Of Ganges. Overnight At The Hotel. We Do Early Morning Boat Ride On Ghats Of Ganges And We Come Back To The Hotel And Later We Do Tour Of Sarnath And Overnight At The Hotel. Breakfast At The Hotel And Timely Departure From The Hotel To The Airport To For Your Onward Journey.